It looks like another phone... but which? Sorry about the watermarks... but hey, what are you going to do? Those of you waiting for another touchscreen handset to hit the market will be happy to find out you won't be waiting for much longer, thanks to some leaked marketing shots of the BlackBerry Storm. 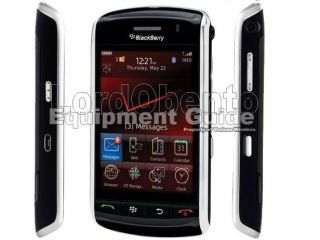 After reports of the touchscreen interface being full of bugs and forcing a development rethink, the handset finally looks ready to debut as the first full touchscreen BlackBerry device, thanks to pics leaked on CrackBerry. Although a lot can't be gleaned in terms of functionality from the leaked pictures, confirmation of things like a 3.2MP camera (WITH flash) and GPS is always comforting. Weirdly, there are separate icons for Messaging and SMS, although given the e-mail centric nature of this handset a division is more than acceptable. A flush touchscreen reeks of an Apple device, but it won't be until we get a hands on do we find out whether the gesture recognition will place this handset in the upper touchscreen echelons.